Not long ago, the only time you had chicken and waffles after 10am was when your school had the nerve to call chicken nuggets and Eggos "Breakfast for Lunch". But now in addition to being an essential brunch food -- and part of any self-respecting boozy brunch -- it’s become a comfort-food favorite. 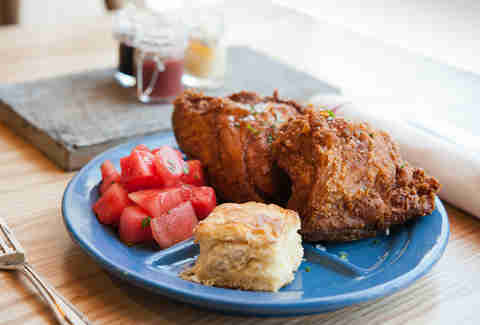 And these seven places make 'em better than anyone... including your favorite lunch lady. When you name your restaurant after fried chicken and you don’t end up on every single list like this, then you’re basically the restaurant equivalent of Johnny Manziel. Fortunately for this South Beach favorite, their version -- served on a cheddar cheese waffle with honey hot sauce and spiced watermelon -- lives up to the hype, and hasn’t gotten beaten out for anything by Brian Hoyer. The Broward-based burger stalwarts and their chicken & waffles bring something to Miami that’s almost nonexistent: efficiency. That’s because they don’t make you fight with a chicken bone to get to the hot, juicy, all-white meat on top of their mini waffles. 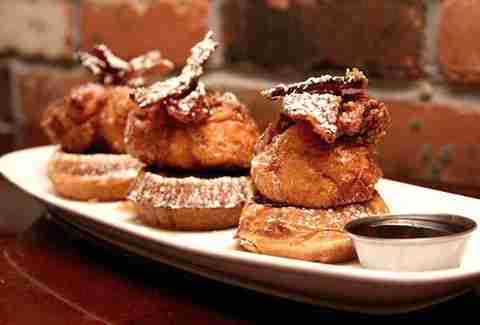 Each piece is boneless and placed atop said waffles, then topped with candied bacon. You can devour all of it without ever needing a knife. 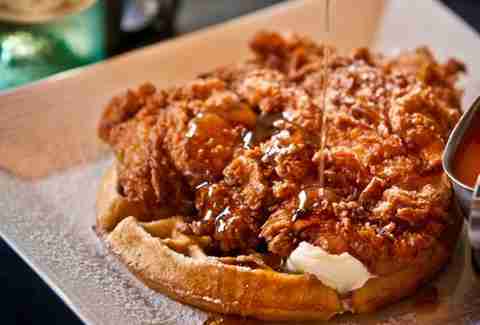 In case you haven’t figured it out by now, there’re a lot of good chicken and waffles in Miami. 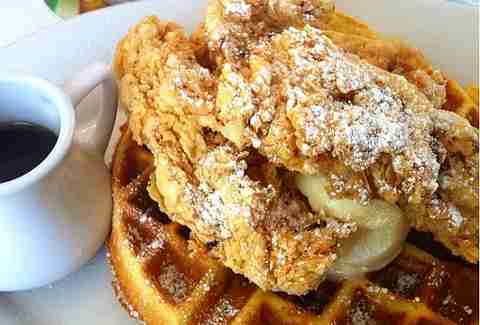 But only one was named the essential chicken and waffles by our brunching gurus. It also might be the only thing other than pool parties that people will wait outside in line for during the summer. 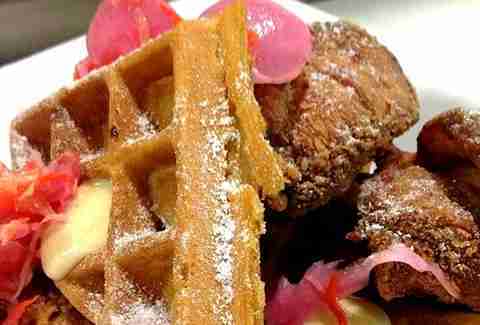 Yes, we can hear you laughing, “Oh that Thrillist, they love strip clubs sooooo much they actually think the chicken and waffles at this place are better than fill-in-the-name-of-a-restaurant-you-like-that’s-not-on-this-list”. 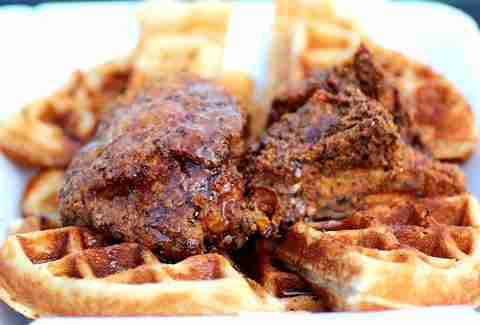 But have you HAD the chicken and waffles at Tootsie's? Just hit the sports bar in back and you’ll see why we think these pepper-buttermilk babies on top of hot, fresh waffles with bourbon maple syrup are the best thing about this place. And remember, this place is full of scantily clad women. 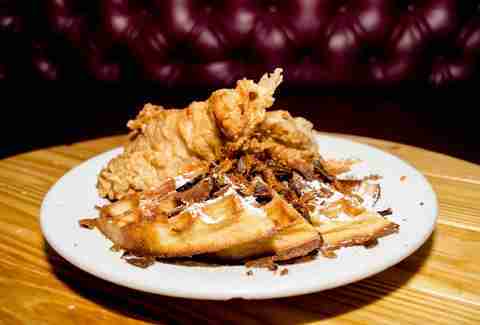 Given the name of this Wynwood burger-and-beer bar, you might think that people are ingesting their chicken and waffles because they've been inhaling something else, but no, it’s probably got more to do with the bacon-topped waffles, the crispy fried chicken, and the glorious powdered sugar they sprinkle over the whole thing. 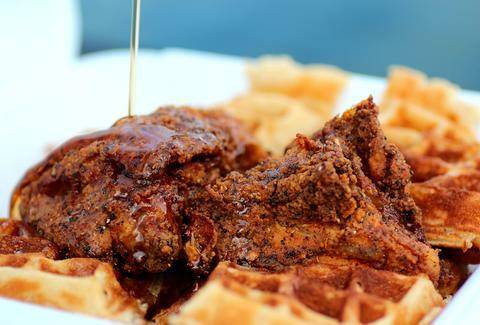 Miami's second best steakhouse serves oversized chicken pieces on top of equally king-sized waffles w/ maple syrup. They're so good you might want to make a reservation so you can get seated within 60 minutes of... oh who are we kidding? Better bring an extra $75 for drinks at the bar, you’re gonna be there for an hour and a half.